AASA is pleased to announce that at 5 PM on Sunday, June 16th, we will be honoring Helen Ota, Gail Gerding-Mellert, and The Roland Corporation our 2019 Bravo Awards Gala at the LA Grand Hotel Downtown. 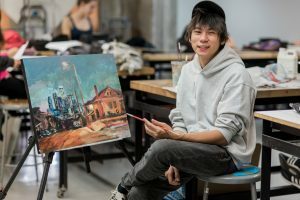 On May 5th, the Asia America Youth Symphony will perform “An American In Paris” while artists from Ryman Arts create inspired artworks on stage. Ryman Arts is a nationally recognized non-profit organization established in 1990 that creates access and opportunity for young artists through free studio art skills training and mentoring. Ryman Arts has educated thousands of Southern California teens from over 190 communities and provided outreach to over 20,000 inner city students. 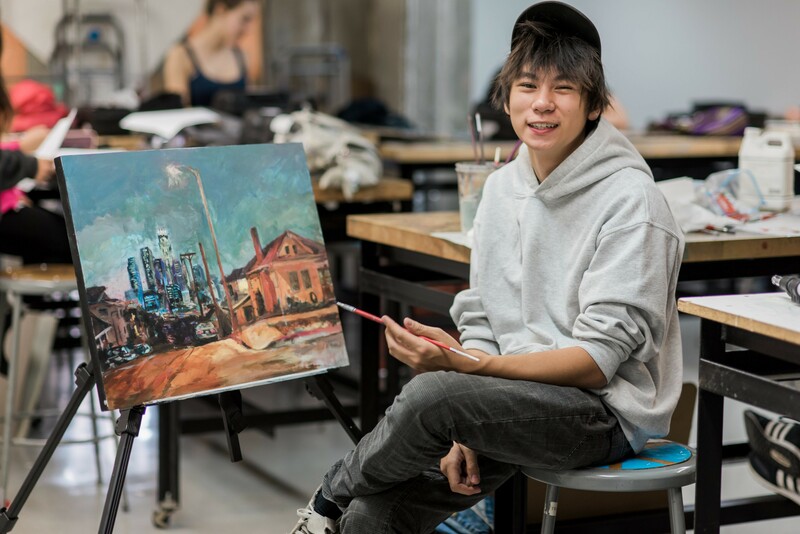 Students choose to attend Saturdays at California State University, Fullerton or Sundays at Otis College of Art & Design. Almost all Ryman Arts graduates go on to college, many alumni work in the creative industries, and all are poised for personal success. 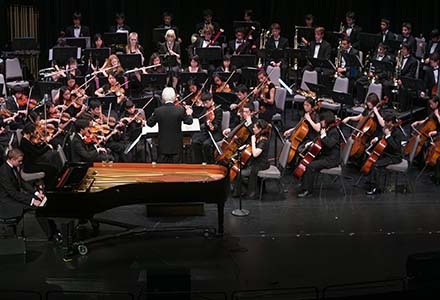 ASIA AMERICA YOUTH SYMPHONY through a varied program featuring Asian (EAST) and American (WEST) music. This marks the orchestra’s 17th annual Spring concert and will feature the following: George Gershwin’s An American in Paris and Japanese, The Surfin’ Medley arranged by David Benoit, Alexander Borodin’s In The Steppes of Central Asia, David Benoit’s Soul to Seoul , and a brand new selection composed by maestro Benoit for flute and piano, which will receive its world premiere! 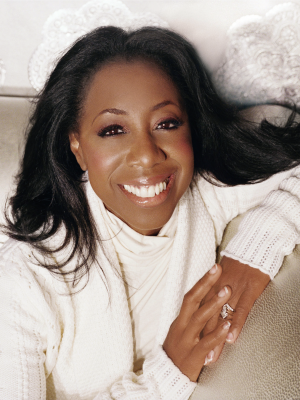 Go no further than the South Bay to hear and experience the beautiful music of East meets West! On Tuesday, January 22nd from Noon to 1:30 PM Solo Guitarist TJ Brinjak will be performing at Luna Rossa Ristorante (550 Deep Valley Dr, Rolling Hills Estates, CA 90274). One half of the tip-jar for this event will be presented to the Asia America Symphony Association. The AAYS Jazz Quartet is set to be featured performers at the Natsumatsuri Family Festival on August, 18th at the Aratani Central Hall, sponsored by the Japanese American National Museum. They will be performing from 3:40 PM to 4:00 PM. The AAYS Jazz Quartet is set to be the featured performers at the Omotesenke Tea Ceremony Banquet on Saturday, July 28th at the Miyako Hybrid Hotel in Torrance. 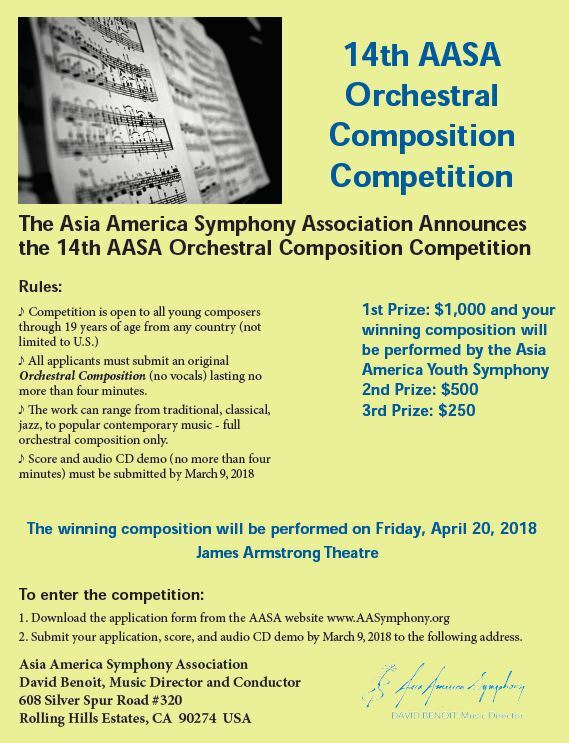 We are pleased to announce that the application processes for our DK Kim Scholarship and the 14th Annual AASA International Composition for Orchestra Competition are officially open! The application form for the DK Kim Scholarship may be viewed here. The application form for the Composition Competition may be viewed here. Its flyer may be seen here. Save the date for our Annual AASA Bravo Awards: June 10th, 2018 at the LA Hotel. We are pleased to announce that AASA’s Annual Tennis Tournament will take place on Sunday November 12, 2017 at the Palos Verdes Tennis Club and Peninsula Racquet Club. A Dinner and Awards Banquet featuring a performance by Maestro David Benoit will follow later that evening at the Palos Verdes Golf Club. Join us for a day of friendly competition and an evening of cocktails, dinner, and unforgettable music by registering here today!